And in this sense the book is a success. Stories gets you hooked and leaves you hanging for the next page’s fix. Roddy Doyle’s Blood begins the anthology and tells the story of a man discovering his disturbing taste for fresh raw meat, the tale with a twist at the end setting the tone for many of the stories that follow – a neat little hook to drag you in, an engaging, imaginative tale unfolding through ten pages or so, and then a vicious cast-iron curlicue twist to leave you lying dazed (but certainly not confused. More like dazed and enthused). And although there is a macabre common thread running through this book, which adds a certain dark weight to some of the tales being told, and which seems to get heavier as the book wears on, the writing is not heavy. In fact, the writing is pretty light, making the book a very easy one to read. That is not to say, however, that because they are easy to read that all of the stories in Stories are necessarily good ones. I personally found Stories to be a bit hit-and-miss. For instance, Doyle’s Blood as an opener was a good hook and I enjoyed taking that introductory bait – surprise uppercut twist and all; Neil Gaimann’s Black Mountains and Lawrence Block’s Catch and Release had me enthralled with their fascinating and highly detailed and disturbing characters. Likewise, the Price Is Right frat-party acid frenzy of Chuck Palahniuk’s Loser, and the pulp-fiction sci-fi drama of Gene Wolfe’s Leif in the Wind. On the other hand, Joyce Carol Oates’ Fossil Figures left me feeling slightly cold and cheated, like the twist in the tale was a little cheap. So too Jodi Picoult’s Weights and Measures – despite tugging at my parental heart-strings with it’s descriptions of a couple dealing with the death of their child. They both felt like I was reading a trashy rip-off of Stephen King or Raymond E. Feist, not particularly magical, and not like something I’d never seen before. 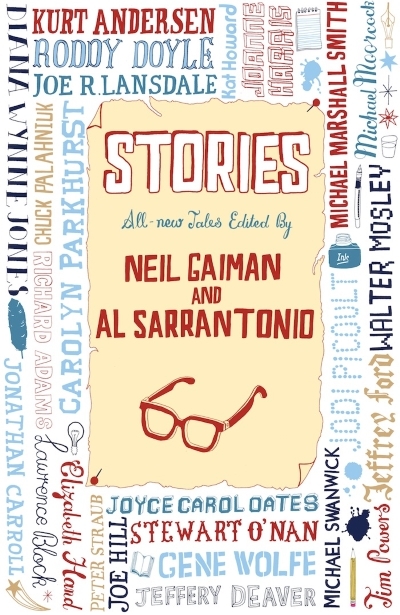 Overall, Stories is a successful page-turner – the imaginative pulp-fantasy and genre-defying stories and the twisted endings that many of the stories contain makes for entertaining reading. Whether or not all of the stories in Stories are, as Neil Gaimann so grandiosely claims in his introduction, “a lightning flash of magic”, or whether they are presenting us with “something we have already seen a thousand times as if we have never seen it before,” is questionable. For more on this book go to: www.goodreads.com/book/show/7637398-stories.